Hey, baby what’s your sign? They cut off the stingers so everything is fine. those were the best part. Spicy…extra stingers for me! No. No, that is not fine. That is DEFINITELY NEVER fine. As long as there are no Anchovies. No, thank you. The legs get stuck between my teeth. Care for another fat slice of Nope? 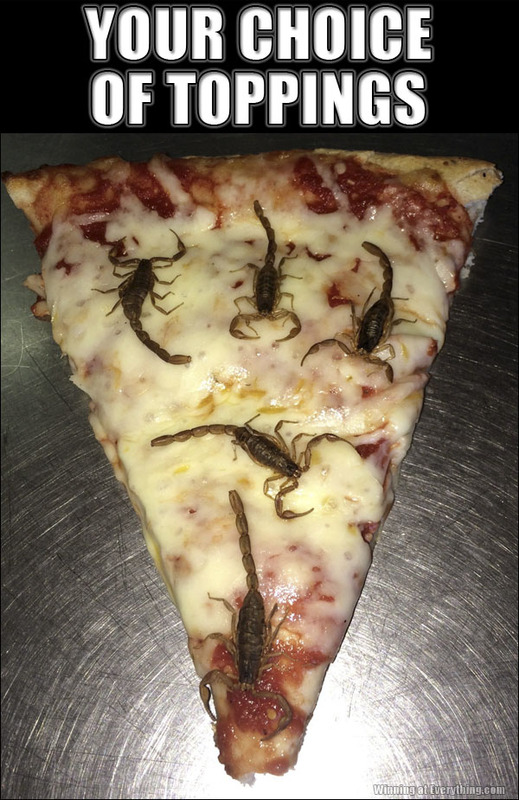 The least popular of the Zodiac themed pizzas was “Cancer”; the tumors kept popping in the oven. I have only tried these in a shot, not on a pizza, and I don’t recommend. I thought I would be able to swallow whole, but I was wrong. So I tried to chew it, but it’s fairly tough. So I ended up having to grind in down into chunks and feel various pieces get stuck as went down my throat…damn you alcohol!